A Muddled Mother: A New Year's Resolution That Involves Wine and a Tiara? Sign Me Up!! A New Year's Resolution That Involves Wine and a Tiara? Sign Me Up!! After much prayer and much conversation with Dr. Speed Dial, I realized that like so many of us, much of my self-worth came from outside and not from within. I am not sure I ever really understood that loving myself was as essential as loving my children, my husband, and my God. I had fallen into the trap that oodles of parents fall into in which we give and we give and we give to all the others in our lives; hugs, kisses, advice, time, space, understanding, wisdom, our laps, our sanity, and love–we give so much love that quite often we forget. We do forget don’t we mommies and daddies? We forget that in order to KEEP giving to others, we must remember to give to ourselves. It is essential that we love who we are as much as we love those we hold dearest. So although it was April, four months into the new year, I made an unorthodox albeit late resolution to give the gift of love to myself daily, to start loving myself right away. Living this way for the past 6 months, I have found that there are so many powerful results of loving oneself. For one, you begin to claim your life and become much surer of who you are. It feels damn good, and best of all, you never again have to hand over your personal power to someone else saying, “Here you go. Hope you don’t break it.” Nope not anymore. Now, I know that that seems like a task that is easier said than done. After all, a parent’s days are so full of the responsibilities that come with loving others that there’s no way to find time to love ourselves. Au contraire! 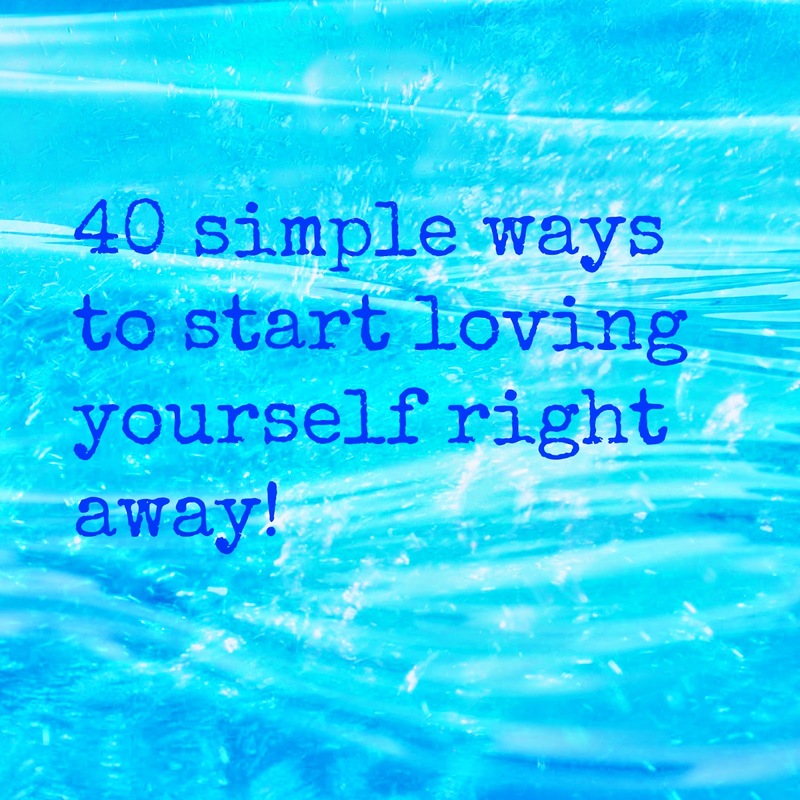 Loving ourselves is much simpler than it sounds. It doesn’t cost much if anything at all and after a bit of practice, the “how” to love ourselves becomes easy and automatic. Think this might be a resolution you can and should keep? Check out the list of things I did this year. They just might help you get started. Have any other ideas? I’d love to see them in the comments section! Take a bubble bath wearing a tiara, holding a glass of wine in one hand and a good book in another. Embrace the unknown. You never know what opportunities will come from it. Need a reminder? Make a list of reasons of why you love yourself. Read it before bed. Stretch in the mornings. There are fabulous short, quick and speedy yoga videos to get your juices flowing. Try them out. It feels so good. Reach out to others. It just takes one person with whom you can be vulnerable. Do you know someone like that? Know that you are good enough ALL THE TIME. Even when you don’t feel like that’s true…no…ESPECIALLY when you don’t feel like it’s true. Do your very, very best to stop judging people…including yourself. Increase the amount of greens you eat. Listen to new types of music…and even if it’s in the kitchen…DANCE. At least once a year, treat yourself to new clothes. Change your alarm clock to something that makes you smile! Got a favorite song? Have that wake you up. Nothing says, “I hate myself” like starting off your day with an annoying repetitive blast! Wear fuzzy socks in the winter. Know that you deserve love…and ONLY be with those who do. Be vibrant and colorful. If not in dress, then in word and action. Have integrity. Nothing helps one sleep better than knowing that all intentions were kind and good in nature. Do something that you’ve been afraid to do. Find amazing new role models. My new go-to-for-inspiration is Amy Ferris, author of Marrying George Clooney! Don't know her? Oh..You must make time!! Stop–just stop–trying to fit in. You are fine…you are just fine the way you are. Get out everything that you’ve been holding onto. Decide how you want to be treated by others and do not accept anything that doesn’t coincide with that decision. Write a letter to yourself as a child. Tell him or her the things they need to hear. Use Facebook. There you’ll be connected with acquaintances who may become your dearest friends, you’ll find like-minded humans, read interesting articles and find needed diversions from stress and anxiety. Bake, create, ski, write, read, play games, do puzzles, do something, do ANYTHING preferably that is not related to a mommy or daddy duty. Forgive…That does not mean forget, accept or all is fine and dandy. Forgiveness, as Dr. Maya Angelou tells it, is saying, “I am done with it because it’s best for me and my wellness.” Forgive…be done with it. Speak to yourself with kind tones, with words of wisdom, coo and coddle and use a voice that is meant for the smallest infant. Rely on yourself. Be loyal to yourself. Do all for yourself that you used to wish someone else would do for you. Accept and revel in genuine compliments!